Annapurna Himalaya range, one of the massive mountain range in all Himalaya and probably around this planet earth a spectacular destinations for all types of travelers where walk leads from leisure-moderate-adventurous to challenging crossing high passes like Thorang-la above 5,416 meters. Annapurna Himalaya range a country of great fascinations from low warm areas of beautiful Pokhara blessed with natural beauty of mountains-rolling green hills-valley and simmering lakes where most of the trekking and various adventure within Annapurna and beyond starts and ends on this lovely city at Pokhara. Annapurna Himalaya range with wide interesting and scenic areas for trekking-climbing with touch of local culture and hospitality of hill villagers where you can find comfort in its nice cozy lodges on route trekking even at Annapurna base camp at the height 4,130 m high with rooms facing super views of mountains. Annapurna offers trips on its side of the mountains from East to West or North to South with enjoyable and thrilling times where ever and what options of destinations you choose provides you with glamorous scenery including striking sunrise over chain of Himalayan peaks. 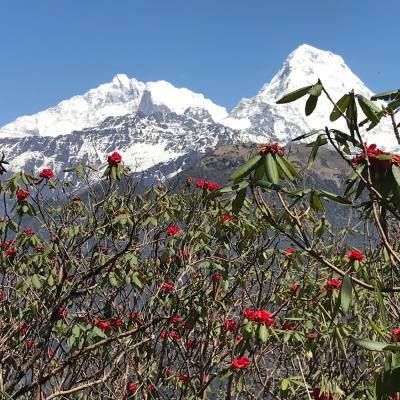 Annapurna Himalaya range famous for its green high hills covered with tall rhododendron forest regarded as world largest natural garden with great contrast with snow capped peaks and colorful culture of the natives of Annapurna Himalaya. Explorer Adventure offers wide range of trips in our list covering all Annapurna Himalayan range from moderate to adventurous walks for your interest and delights.